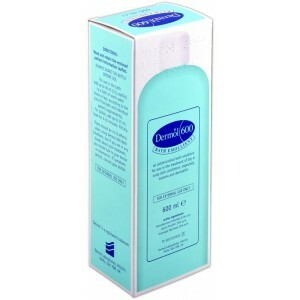 Dermol is a bath additive which help the skin to stay moisturised. If you have a dry skin condition, such as eczema or dermatitis, our prescribers can issue a prescription for Dermol bath. Press the green button below to get started. How does Dermol bath work? How do I use Dermol bath? Dermol bath is an emollient which is intended to treat dry skin in people with conditions such as eczema or dermatitis. Eczema is a relatively common skin condition which causes patches of dry, flaky, itchy and sometimes painful skin. The condition can be isolated to a specific area of skin, such as behind the knees, inside of the elbows or on the hands and feet, or it can be widespread across the entire body. Scratching patches of eczema can make the condition worse, as the skin may break and be susceptible to infections. The condition occurs when the outermost layer of skin cannot retain moisture. This causes skin to dry out and flake. Dermol bath contains three main ingredients. Liquid paraffin and Isopropyl myristate aid to moisturise the skin by fortifying the natural protective layer of the skin. They can also prevent irritation and drying which can occur with certain toiletries. Benzalkonium chloride is an antiseptic which prevents bacteria from infecting broken or damaged skin. Together, the active ingredients of Dermol prevent the skin from drying out and reduce the chance of bacterial infections. For adults with dry skin, Dermol should be added to a bath. Shake the bottle before every use. Add one and a half capfuls of Dermol to a warm, but not hot, bath. Use a soft sponge to cover the affected areas of your skin with the bath water. Bathe for around 5 to 10 minutes. When finished, carefully climb out of the bath. Dermol may make the bath slippery so take extra care. Using a clean, dry towel, pat yourself down. Avoiding rubbing yourself dry as this can exacerbate your dry skin symptoms. When using Dermol, avoid staying in the bath too long as this can exacerbate dry skin. Keep Dermol bath out of the sight and reach of children. All medicines carry the risk of side effects, though not everybody gets them. It's important to make yourself aware of the risks associated with your medicine before using it. If you notice any side effects, whether they are listed above or in the patient information leaflet, cease using the product and report them to your doctor. What should I do if I forget to take Dermol when I should? If you forget to use Dermol when you should, us it as you normally would the next time you have a bath. Do not use more of the medicine to make up for a missed dose. What should I do if I accidentally ingest some of the medicine? If you accidentally ingest some medicine and feel unwell afterwards, seek emergency medical attention. Can I use Dermol while pregnant or breastfeeding? It is considered safe to use Dermol while pregnant and breastfeeding. Though safety trials have not been conducted, the ingredients have been used in similar preparations for many years without reports of problems. Can I use Dermol with other products for dry skin? It is considered safe to use Dermol with other products which your doctor or pharmacist may give or prescribe to you for your dry skin. Some soaps and bath products can irritate your skin or make your symptoms worse. Speak to a pharmacist about bath products which are unlikely to affect your dry skin condition. Dosage: Apply one and a half capfuls to a warm but not hot bath and bathe for 5 to 10 minutes.